NEW YORK – Truth Wins Out condemned conservative activist Ann Coulter today for her cruel and mindless attack on the alleged sexual harassment victims of GOP presidential candidate Herman Cain. 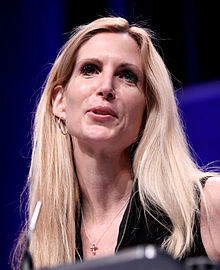 Coulter’s smear campaign was devoid of facts, despicable, and insensitive, says TWO. Commenting on the Cain incident on Fox News Channel’s Geraldo At Large, Coulter recklessly and irresponsibly slammed these women without knowing the details of their allegations. Rivera: In the words of Clarence Thomas, the Supreme Court justice? The media has not been shy in covering the sexual scandals of white Democrats such as John Edwards, Elliott Spitzer, and Gary Hart. So there is no merit to Coulter’s inflammatory and fabricated portrayal of this situation as a liberal conspiracy to bring down a conservative African American politician. Finally, Coulter owes Anita Hill an apology for suggesting that Clarence Thomas is innocent and the victim of a “high tech lynching.” Hill’s allegations against the Supreme Court Justice remain as credible today as they did during the confirmation hearings, says TWO. Politico broke the story today that claimed Herman Cain had allegedly sexually harassed two women while he was the head of the National Restaurant Association from 1996-99. According to Politico, “Cain and his campaign repeatedly declined to respond directly about whether he ever faced allegations of sexual harassment at the restaurant association. They have also declined to address questions about specific reporting confirming that there were financial settlements in two cases in which women leveled complaints.” In one case, Politico says that it had seen documentation describing the allegations that showed that the restaurant association formally resolved the matter with both women receiving separation packages that were in the five-figure range.